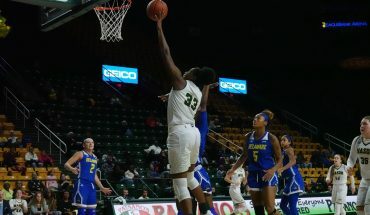 The shot bounced off the rim, much to the chagrin of the George Mason players – all except Natalie Butler, who leaned forward to grab the rebound. She quickly passed the ball to a teammate before throwing her hands in the air as the final fractions of a second tick off the clock and the buzzer sounds to end the quarter. She knew what that rebound meant. It’s her 540th rebound this season, setting a new NCAA single-season record. 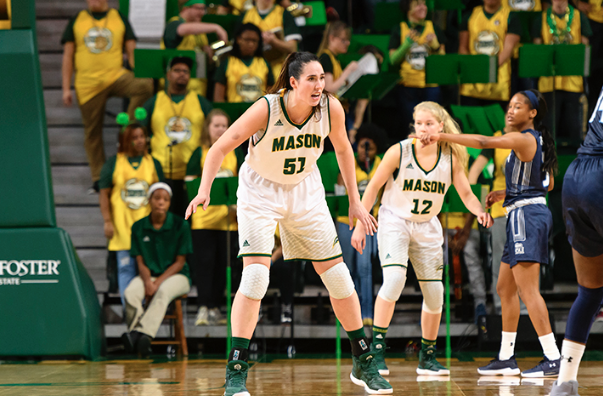 Mason would go on to beat Stephen F. Austin in the opening round of the WNIT on March 16, the first postseason victory in program history. After the game, Butler jogged over to her head coach, hugged her and lifted her up off the ground. The surprise on the coach’s face is captured forever in a photo that perfectly summarized how far the team and Butler herself has come in one year, from a bench player at the University of Connecticut to an NCAA record holder while playing for her hometown school. Natalie Butler began playing basketball in Fairfax. It’s also where she finished her college career, and where she found out the next step in her basketball journey was about to begin. As a child, she looked up to her father, Vernon Butler, one of the players that helped lead Navy to the Elite 8 in 1985. 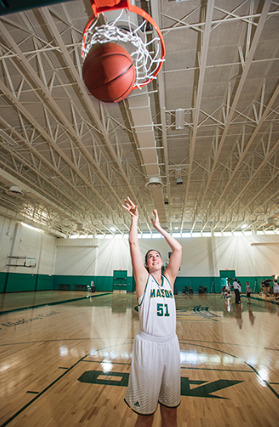 Growing up in Fairfax Station, Butler began playing basketball when she was five. As a child she looked up to her dad, Vernon Butler, who more than thirty years later still stands second all-time both in scoring and rebounding, behind only NBA Hall of Famer David Robinson at the U.S. Naval Academy. 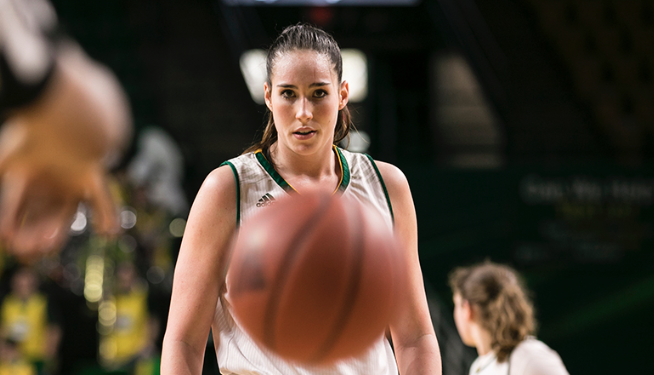 Growing up she was aware of his rebounding achievements, which helped to create her focus on rebounding, her goal of playing at the Division I level and creating a record of her own. And she did. Butler grew up playing not only basketball but other sports as well. She played soccer until high school and picked up volleyball her sophomore year, both of which became cross training for basketball. Volleyball not only provided her with a sense of camaraderie she really enjoyed, but it also helped her with her blocking in basketball. In her senior year of high school. she averaged 10.1 blocks a game. With her eyes set on getting her jersey retired and breaking a rebounding record like her father, Butler was determined to be a post player, though a late growth spurt almost got in her way. Butler said that she was uncoordinated and overweight for much of her youth, and didn’t hit her growth spurt until high school, shooting up to 6-foot-2 by the beginning of her sophomore year. This was after she had almost been cut from the freshman basketball team. “I had a lot of coaches tell me that I’m not going to go play D-1, and I needed to start working on my guard skills because I’m not going to be a post player,” Butler said. Despite the criticism from her coaches, Butler continued to work hard and used these disparagements to prove that she could, in fact, play on an elite level. Butler committed to play at Georgetown the summer before her senior year, a decision that came down to several factors, including location, coaching staff and academics. She knew she wanted to go close to home and to a program where she would be able to play and develop. In her first season at Georgetown, Butler was the only Hoya to start all 32 games. She averaged 13.9 points and 13.3 rebounds per game. She set the Big East single-season rebounding record with 425 rebounds on the way to winning Big East Rookie of the Year. Hours after she received her letter of intent to transfer, she received phone calls from schools looking to land her. One school that gave her a look was the University of Connecticut, home to one of the best women’s basketball programs in the country. Butler didn’t originally see herself at Connecticut, as she was concerned about getting a chance to play, but after what she referred to as a candid conversation with Hall of Fame coach Geno Auriemma, she committed to play there. She looked to how WNBA center and recent Connecticut graduate Stefanie Dolson was able to develop during her four years. During her career, Dolson became one of only five Huskies to score at least 1,000 points and grab at least 1,000 rebounds. Butler wanted to follow in her footsteps and try to develop as much as Dolson did. Coming to Connecticut provided a new level of media exposure that Butler had never experienced before, as well as a larger number of fans than she was used to playing in front of. She said that the supportive fan base, with 10,000 fans coming every night, is an environment that every college athlete wishes to play in, and it’s something she is glad she was exposed to. Butler, who contributed in a limited role coming off the bench, intended to study international business at Connecticut, but was forced to switch to communication after the program was discontinued. She was still interested in pursuing her international relations interest, so she decided to come home to Fairfax to get her Master’s in Global Affairs from Mason. To play at Mason, Butler needed a waiver. If the waiver wasn’t approved she would have simply gotten her Master’s without playing another year of basketball. Butler’s father related it to stepping off a cliff and hoping there was another step there. Butler’s waiver was approved and when asked what she wanted to get out of a fourth year of basketball Butler responded, “Just to prove to myself that I could play, as crazy as that sounds.” After facing a lot of adversity throughout her college career, she had let doubt creep in and had begun to wonder if she could still play at this level. Butler came into this season without any expectations. Unsure of how the season was going to go she did not spend much time dwelling on being named to the All-Conference Preseason Third Team. Butler started off this season with 13 points and nine rebounds against Michigan in the opening round of the Preseason WNIT, the only time this season that she grabbed less than ten rebounds. She would finish the season with 33 consecutive double-doubles, tying current Seattle Storm center Courtney Paris for the NCAA record. A few days later on April 12, Butler was drafted thirtieth overall by the Dallas Wings, making her the first Mason women’s basketball player to be drafted.